If you have been impatiently waiting for Milwaukee to release their 2626-22 M18 Cordless Oscillating Multi-Tool to use alongside your other Milwaukee cordless tools, you won't have to wait much longer—like maybe only a few more days. Along with a freshly delivered press release (below) as evidence, ToolBarn.com has them listed as shipping October 1st. MILWAUKEE, WI – Milwaukee Tool Corporation continues to expand the fastest growing 18V cordless system on the market with the introduction of the new M18™ Cordless Multi-Tool. Designed to increase productivity and ease of use for professional users, the new tool delivers up to 50% faster cutting and 2X longer run-time than the competition, while featuring time-saving solutions like a tool-free blade change and universal accessory adaptor. 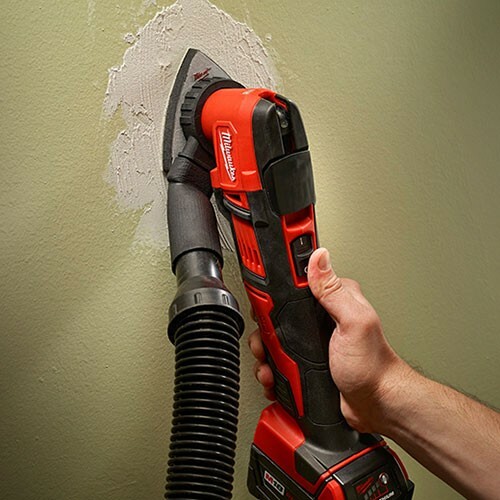 "We continue to find ways to bridge the gap between the speed of corded options and the convenience of cordless solutions," says Christian Coulis, Director, Cordless Product Marketing at Milwaukee Tool Corporation. "Featuring Milwaukee's Constant Power Technology to maintain cutting speed under load, the new Multi-Tool truly delivers superior performance with the fastest cutting speeds in its class to increase productivity on the jobsite." With a variable speed of 11,000 to 18,000 OPM and 12 speed settings, users can match the speed to the application at hand to complete tasks such a flush or plunge cuts, removing grout, grinding thinset, sanding or scraping. Ideal for remodelers, flooring contractors, maintenance repair technicians and electricians, the M18™ Multi-Tool comes complete with a universal accessory adaptor to allow the tool to work with all major competitive accessories on the market, as well as a tool free accessory change that allows the user to quickly move from one application to the next. In addition to the Multi Tool, Milwaukee will also introduce two accessory attachments with this launch that can be purchased separately to further increase productivity on the jobsite. The new Dust Extraction Kit will give users the option to keep their work area clean of debris, and the new Depth Stop Kit will give users the confidence to complete plunge cuts without damaging hidden materials. Powered by Milwaukee's revolutionary M18™ REDLITHIUM™ Battery, the M18™ Multi-Tool is compatible with the entire M18™ System, now offering over 50 cordless Lithium-Ion products. Milwaukee® is committed to the ongoing development of this platform and will continue to provide innovative solutions that offer industry leading reliability, performance and ergonomics. What is interesting here is that Milwaukee says their tool "delivers up to 50% faster cutting and 2X longer run-time than the competition". Considering Bosch also has an 18V oscillating tool, I am wondering where these numbers came from. You might also notice that Milwaukee's multi-tool offers a slower maximum OPM speed of 18,000 vs 20,000 of that from Bosch. 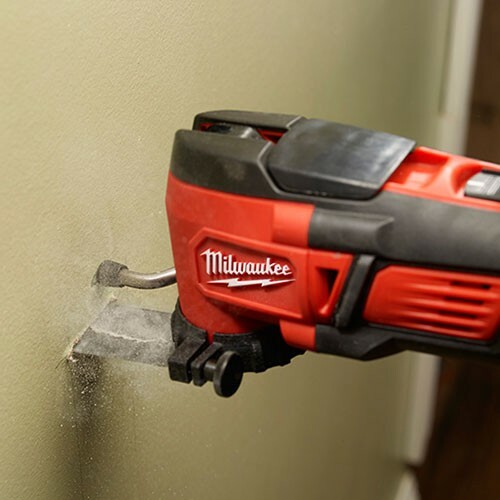 One thing that is not measured in oscillating tools is torque—the ability to not stall during a cut—and I wonder if this is where Milwaukee is coming ahead in power. I am happy to see that Milwaukee has optional accessories like a dust extraction kit and a depth stop kit. Oscillating tools are really good at cutting drywall and plaster, both of which create a ton of fine dust.